Computes have arrived at Rio de Janeiro on Feburuary 26! Computers carried by Olvia arrived at Rio de Janeiro on Feburuary 26. Passo staff together with PEACE BOAT's participants visited slums (favelas) in Mangueira and Vigario Geral in the city of Rio de Janeiro and had a chance to know their activities and social reality. We saw how the children learn computers and citizenship at the school in Mangueira that is famous for its cultural tradition of Rio's Samba. In Vigario Geral that used to be a symbol of violence in Brazil where 21 dwellers were assassinated by military police in 1993, we had a chance to listen the music and activities by AFRO REGGAE, an NGO working for anti-violence activities, educational and health projects for the community and we visited the community with the members of AFRO REGGAE. We appreciate all the support to the Passo project. We will continue our Passo Project. Passo Project was born from the experience of Comitê para Democratização da Informática) (CDI, Committee to Democratize Information Technology), Rio de Janeiro, Brazil. JCA-NET, an APC node in Japan had a opportunity to invite Rodrigo Baggio from CDI in April 1999. The speech by Rodrigo moved the audience and we decided to start this project to send used computers from Japan to Brazil to work with his ideas. The following is a brief introduction of their activities. CDI was established in 1995 and the aim of CDI is to support slum dwellers to set up a Computer Science and Citizenship School inside low income communities in Brazil. CDI was born from the huge national campaign against hunger that is often called as Betinho's Campaign as Betinho, Herbert de Souza, one of founders of APC and IBASE, played a big roll in the compaign. Rodrigo told us how he decided to dedicate himself to this work. "One night, I had a dream. Poor children are discussing their future using BBS. When I woke up in the next morning, I started to think how to realize this dream". 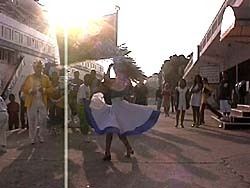 In March, 1994, Rodrigo had succeeded in setting up the first school called Computer Science and Citizenship School in Santa Marta, one of slum communities in Rio de Janeiro. Many people regarded this idea stupid because they thought what poor people need was not computer but food. Soon after the first school opened, they needed to change their thought. Many children made a long line to enter this school. Slum communities need computers a lot! "Poor people are quite eager to learn computers. What we witness is that emergence of social apartheid, digital apartheid. They are quite worried about their future because they are excluded from this world." The result is dramatically successful. There are so many children in Brazil who have give up to go to public schools where they cannot find any hope. "Most of children in slum like computers. We can use this attraction of computers so that children can learn not only computers but also social realities they are facing." Some are involved in drug traficking. "Several young drug trafickers quited from drug deals because they can find hope to survive in the world, not to live in the excluded world." CDI staff don't teach at the schools but they teach some young people inside slum communities. And young leaders teach children at their school. A director of a school is also a person who lives inside slum commmunity. "A Computer Science and Citizenship School is not CDI's schools but slum communities' school. The schools are theirs. They can decide where to go. We have an important principle on this. A school needs to be self- managiable and self sustainable." It is important to call attention to the name of their schools. Computer Science and CITIZENSHIP school. They teach not only computers but social reality. Their method is quite unique. You may notice the influence Paulo Freire's method. Teachers from slum communities, CDI staff, many specialists gathered to make unique method to teach computer literacy for the schools. Computer is not only facinating but also can be a strong tool for them to get jobs. Many children can get jobs now through these school. Social impact is quite big and it is done with no money but with many volunteers and donation of computers. "AR15 is a common machine gun used inside slum areas. We can say that a computer is a real AR15. Arma Revolutionaria de 15 anos (revolutional arm of 15 years), it means that 15 years is the age when slum boys become members of drug trafickers. But through this school they can find alternative to this. Computer is a revolutional tool for them." "It is not an ultimate goal to teach computers for poor children. What is more important is to change their lives." This is why only for few years they could install 80 schools in slum communities including one school in the indigenous village. CDI had worked without any financial support for two years and proved that their activity is sustainable. CDI works with many NGOs and slum communities. IBASE was the first organization that helped CDI's work. Now CDI's office is inside a trade union's office. Not only citizen's organizations but also private companies, big and small support CDI's activity. IBM Brazil donated more than 100 computers and O GLOBO, the biggest TV company in Brazil and the forth biggest in the world, transmit a short notice from CDI thoughout Brazil. UNESCO and other international organziations regard CDI's model as applicable to other countries. With support from such organizations, CDI is now transferring their experience to Mozambique, Mexico and the Philippines. Passo means "a step" in Portuguese and in Japanese, we pronounce Personal Computer as "passo-kon". It is the first step for us to start to make this separated world into one. Copyright (C) 1998-1999 Passo. All rights reserved.